Our monthly series of informal readings of Shakespeare plays continues this Sunday, February 10 at 6 p.m. We’ll be reading The Taming of the Shrew at Hattie’s Hat at 5231 Ballard Avenue Northwest. You’re welcome to read along with us! Just bring a script, either hard copy or online and join the fun. Or just grab a bite and a beverage and enjoy watching and listening. Watch this space and our social media accounts for potential changes to the event in case of inclement weather. 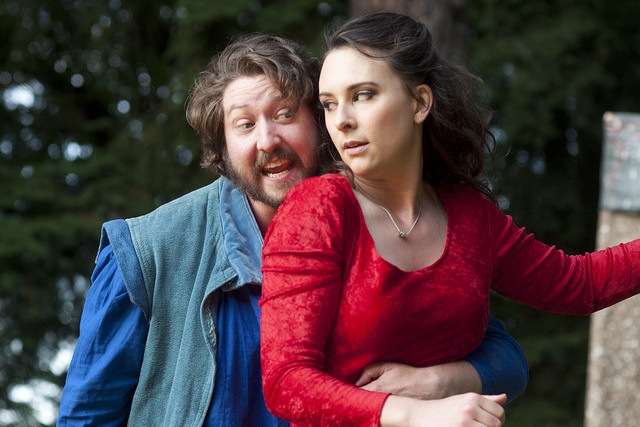 This photo from our 2012 summer production of Shrew features Tom Dewey (left) and Allison Standley as Petruchio and Kate.